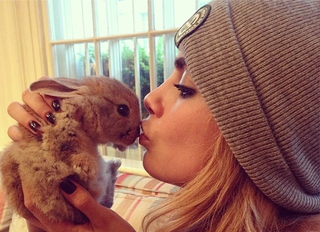 As part of our quest to bring you the latest in celebrity squee related news, it is our distinct pleasure to inform you that model Cara Delevingne now has a bunny named Cecil. You are so very welcome, everyone. Delevingne not only shared a picture of Cecil on her Instagram on Wednesday, she also created a special Instagram page just for the bunny. He already has almost 30,000 followers. (WUT.) And you guys said my idea for an all-rabbit "BunnyGram" social media platform would never take off! Damn you and the people at my bank who refused to give me a loan for this!